Skip the dairy and bacon bits! 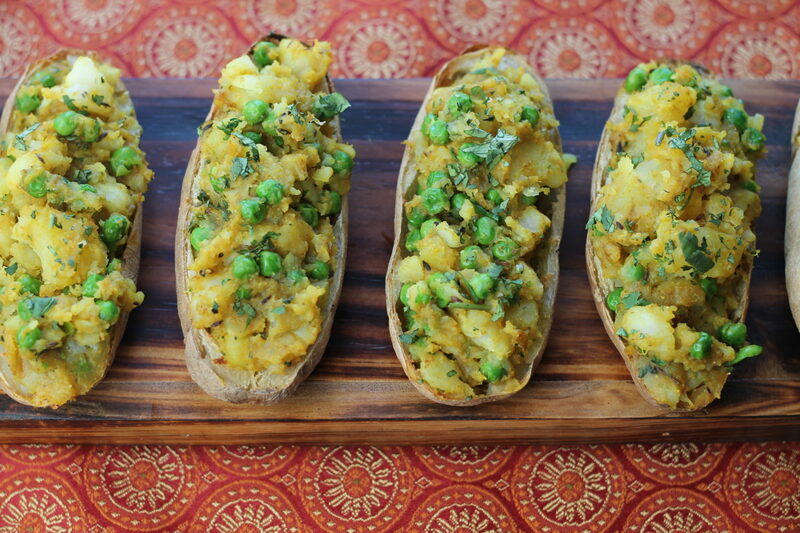 Go Somosa with healthy vegan potato skins! I haven’t met anyone who doesn’t like samosas. That spiced potato filled pocket of goodness that seems to be a requirement at every Indian meal I’ve eaten. I love the spicy aromatic filling that steams when you break open the pastry. How can I get that flavor without deep frying or even messing with the pastry? How about as potato skins? How about baked russet halves heaped with flavorful filling instead of that gloppy cheesy heavy-as-an-anvil filling popular at chain restaurants? NOTE* When you add the pepper-ginger paste to the hot oil, it will spatter, have a screen or cover ready! Either use a mortar and pestal to grind the jalapeno and ginger into a paste or use a knife and mince them together. When potatoes are cooked, place peas in the bottom of a big bowl, cut the russets in half length-wise, and using a spoon scrape the flesh into the bowl. Leave a little flesh on the skin and try not to break the skin. Add the simmered potatoes to the same bowl. In a large pan heat the oil over medium high heat, add the cumin seeds until they start to crackle and pop, add the ginger/jalapeno paste and cook until the raw ginger smell disappears – 1-2 minutes. Reduce the heat and add the garam masala, asafoetida, tumeric, coriander and chili powder one at a time stirring after each addition. 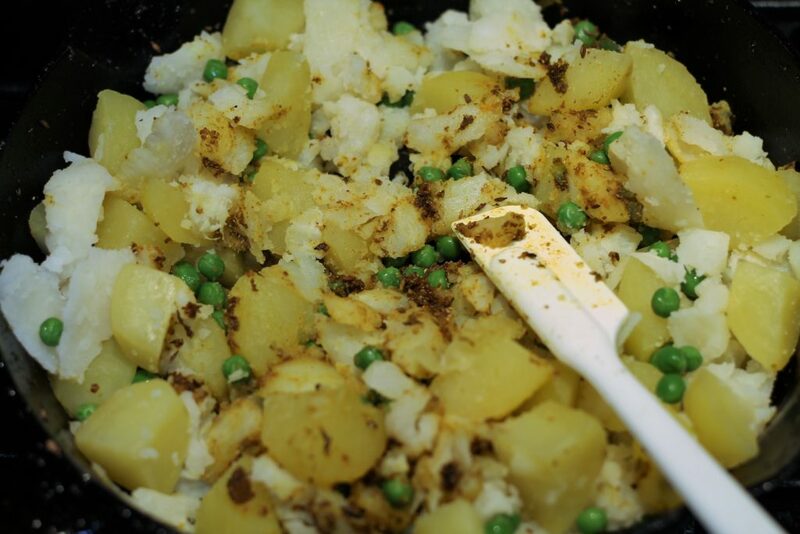 Fold in the potatoes and the peas and stir until potatoes are evenly coated – you may have to add a little water. When the potatoes are coated with the spice mixture, spoon them into the potato skins. If desired put them on a baking sheet in a 350F/180C/GM4 oven to warm through. These were good! Crunchy potato skin, fluffy perfumed filling, with a tiny touch of heat.